From now on, reader questions that I receive in private will be answered here. Since I receive a lot of requests for personal help, I have decided to publish the questions and answers publicly so that others can benefit from it as well. A: Thank you! The buttercream recipe for piping the flower blossom macarons are here. A: You can try using peach gel color (or a mix of orange and pink) in the meringue. Once the macaron is finished baking and cooled off, brush it with some gold pearl dust. A: I always use silicone mats to help retail the shape. If using my recipe, I recommend keeping the meringue stiff and don’t over fold. Your batter might be too runny. A: You can try to let it dry even longer. I have heard another baker let hers dry for several hours. However, if you are only piping round shapes and your batter is correct, you do not need to rest them at all. 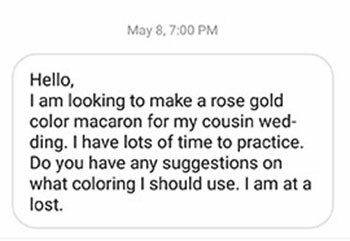 It’s just extra insurance for weaker batters or macaron art with use of several colors. A: Hi! Thank you! The answer I can give you is very similar to the one above. 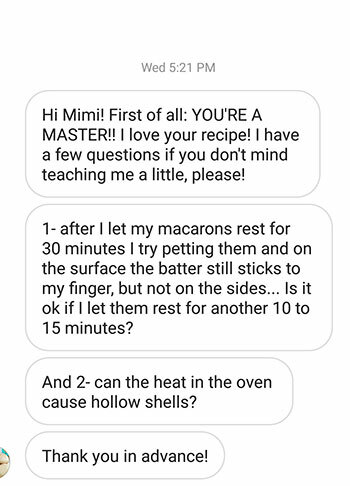 You can try to let the macaron batter rest longer. I have heard another baker let hers dry for several hours. However, if you are only piping round shapes and your batter is correct, you do not need to rest them at all. 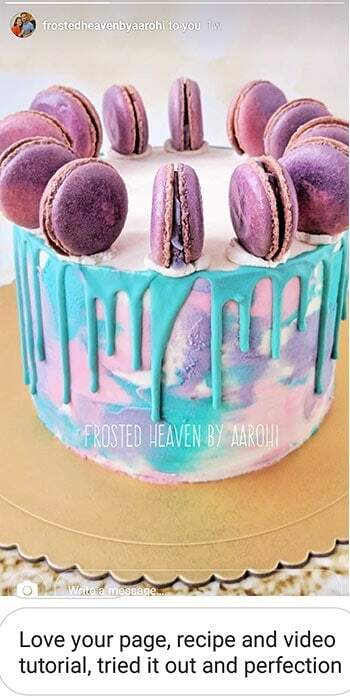 It’s just extra insurance for weaker batters or macaron art with use of several colors. A: You might be overwhipping with your kitchaid mixer. 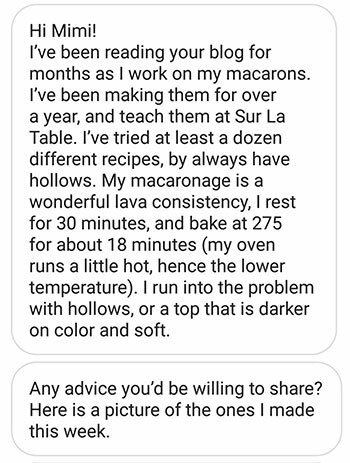 I discuss this issue in this post about hollow macarons. A: Hi, Yes you can double and even quadruple! 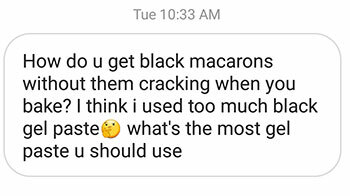 A: I learned from a french pastry chef who ran a bakery. 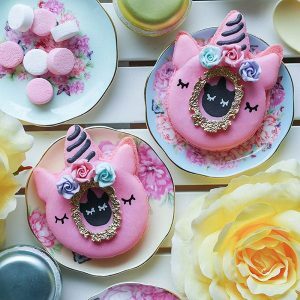 You can learn to make them at Bon Macaron in Vancouver. Good luck! 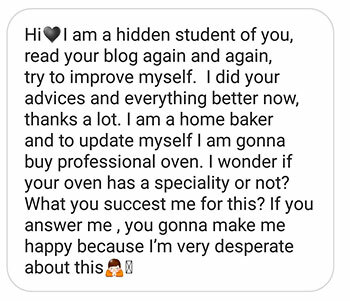 A: Hi, you don’t necessarily need a skin to form for baking. 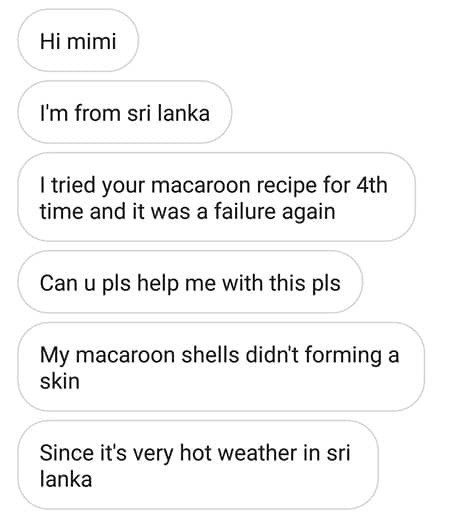 If you really can’t get the skin to develop, bake them anyways. Resting is just extra insurance for them not to crack. If you beat your meringue to a much stiffer consistency, they do dry better. 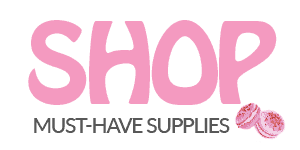 A: I use Americolor’s Super Red and I use about 5 big drops. You can add a bit of dark purple to up the intensity. 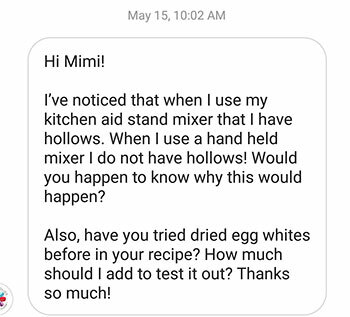 A: Hi, it’s usually not the recipe’s fault if there are hollows, mostly its due to the techniques. 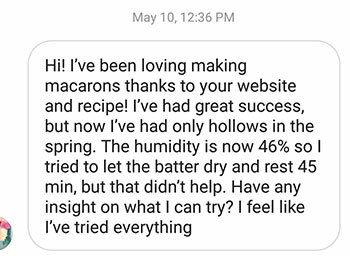 Since you’ve tried so many different recipes, it’s another indicator that there is something wrong with your technique. 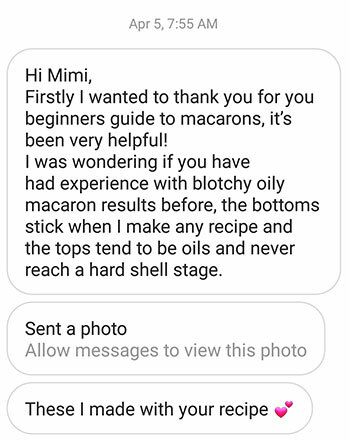 Here is a post which will discuss hollow macarons and how to to overcome it. A: Thank you! 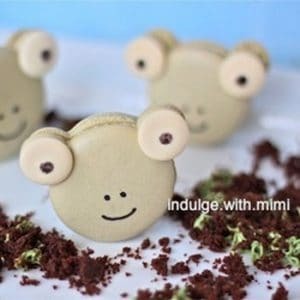 I’ve added it to my Mimi’s Macaron Friends post. A: Wonderful results! These are absolutely beautiful! Thank you for sending it to me. A: Yes I do freeze sometimes if I have extras and I want to save some as extra treats for myself. Just make them when it’s convenient for you and put them inside air tight containers in the fridge or freezer. Make sure to place a parchment paper in between each layer to prevent them from sticking. A: Yes you can definitely wait longer until they are completely dry. Yes, too little heat can cause hollows. Read here how to prevent hollows. A: I would recommend Amazon and only buy the original SILPAT brand. I would start again. I think your batter has been compromised already. 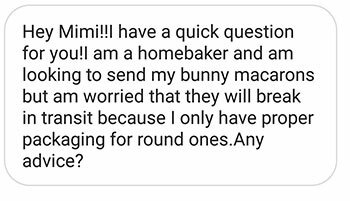 Watch out for these issues: don’t over whip meringue, weigh the almond flour properly, make sure gel colours are new and not expired. A: Thank you! You should watch out that your temperature is not too high and that you have not over folded. A: Thank you so much! I’m so happy you are getting better results now. The possibilities are endless once you learn how to make them. A: Yes you can! Just make them when it’s convenient for you and put them inside air tight containers in the fridge or freezer. Make sure to place a parchment paper in between each layer to prevent them from sticking. A: Please read my troubleshooting guide. It will address that issue under blotchy tops. A: You can try piping them smaller, don’t over beat the meringue and using a bit more heat. 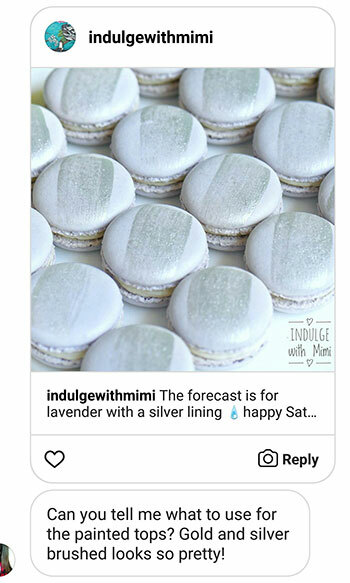 A: I haven’t tried shipping macarons before… if I were to do it, I’d package them each individually in clear bags and them lay bubble wrap in between each layer of macarons with the cooling pads next to it. 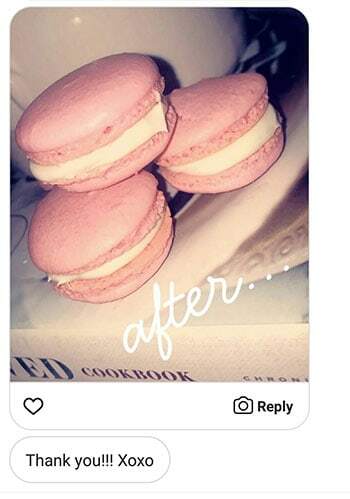 I’d also fill the entire box with of bubble wrap or foam so that the macarons don’t shuffle around which can cause them to break. A: I think it looks GREAT! I really don’t see anything wrong with them. A: I have a home oven that is a dual compartment oven. Here is the link to the answer I gave another reader. Please look at the comment published on March 30th, 2018. Your oven might be the culprit if it doesn’t have a consistent temperature. It’s not the biggest issue. If your batter is correctly prepared, it should only affect it by causing cracking (if too hot but easy fix) or giving you hollows (since the temperature might be dropping). 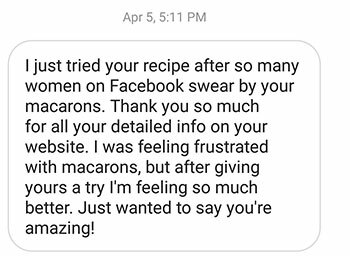 If your macarons look much worse than what I’m describing, I would work on your batter first. 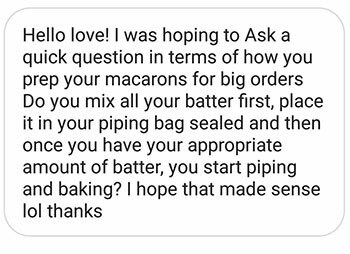 A: I make a large batch of batter and just pipe them all at the same time. I wouldn’t make multiple batters unless they were different colored. The batter can last for a while in the piping bag if it’s sealed. A: Yes, it’s OK to add cornflour/cornstarch to your dry mix. There is corn starch in most powdered sugar brands. 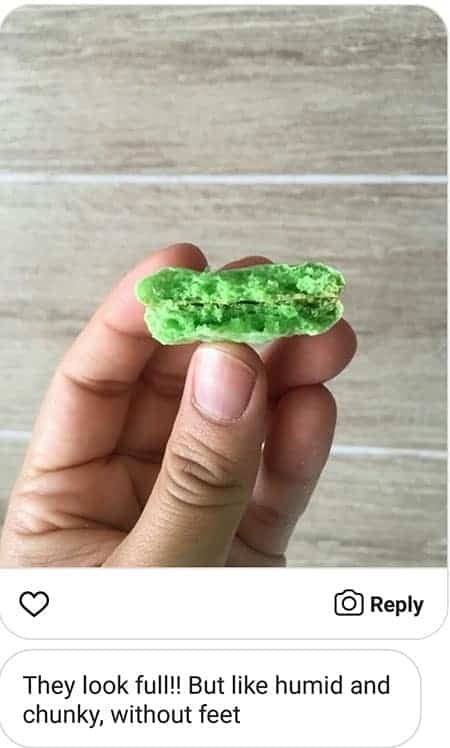 Just check the ingredients on the package. 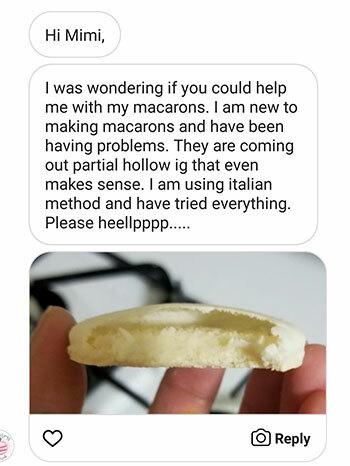 I have heard that adding it can make the macarons less hollow. A: Hi, with my recipe, they should be firm and sticky on the inside immediately when they come out of the oven and once they cool off, they should be crisp. Only after filling and maturing, do them “soften” up. 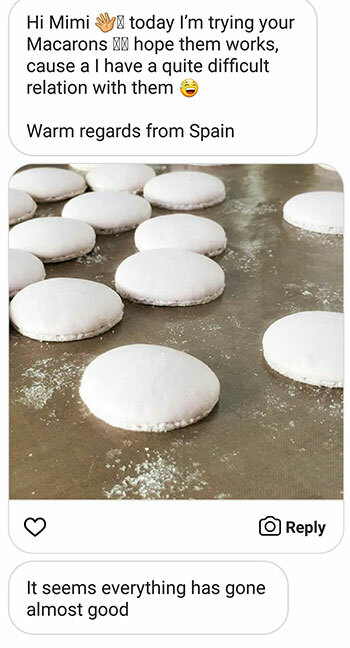 If the meringue is not fully baked, it will collapse after cooling causing hollow macarons. A: Thank you! Yes you can put it into the dry mix of almonds and sugar. Keep in mind, almonds are not naturally white, the shells will always be a bit ivory regardless of how much white you put in. One more thing I want to add is that in the last few years, I read articles about the health effects of inhaling titanium dioxide. You might want to look into a bit more before handling it for use in your baked goods. 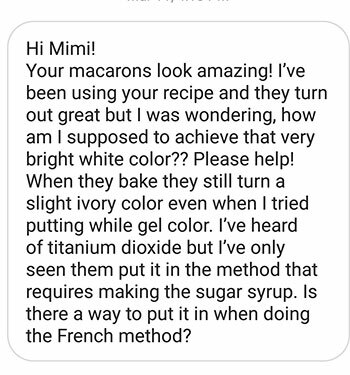 A: I do not make any sugar free macarons. 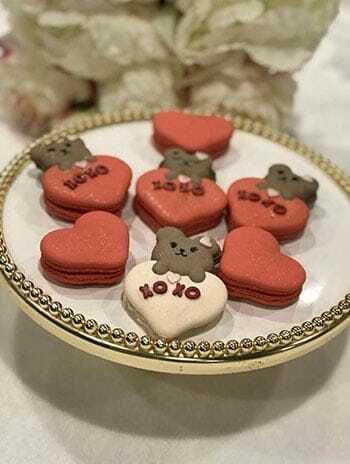 However, all macarons are gluten-free by their simple composition of sugar, almonds and egg whites. A: I use Americolor Black. It works really well. You can also add some black powder colour to make it more intense. 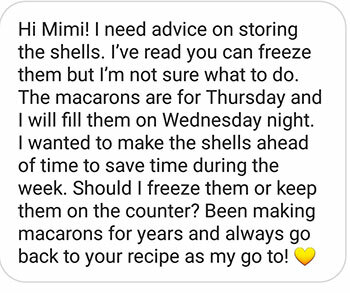 A: You can keep the shells in an air tight container in the freezer or in the fridge until you are ready to fill them. Either one is fine. I would not keep them on the counter. A: I don’t have experience using a commercial oven. For my regular home oven I have had great success with these two temperatures: Big regular sized oven: 325F for 12-14 minutes. Small Dual Compartment Oven: 275F for 16-18 minutes. 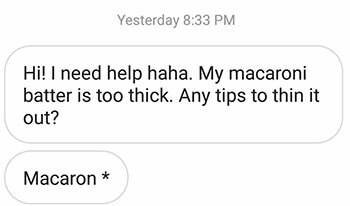 You might want to look at this new post I wrote about all the different ways to combat hollow macarons. Q: I have used your recipe but although they are completely full, they sink. You can see that the dome is not curve, and the feet has really spread, which I’m pretty sure that it is due to the temp, I know I can lower it, and increase the time but, I could avoid them sinking. At the time I took the picture, they were a little toasted, but they were actually chewy when I took’em out of the oven. I baked 330, for 21 min, using silpats in a conventional oven. A: Yes! Definitely too much folding! A: Wow! Wonderful tie-dye effect! 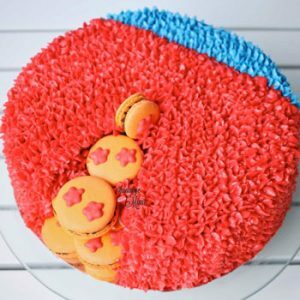 I wish I could make a cake like that too! A: Wow! I love the pretty little feet and how nice and bright they are! I used to use a combination of mobile To-Do-Lists and Calendars (a single app just doesn’t cut it!) but my phone screen is so tiny that it just wasn’t effective for seeing everything all together at once. 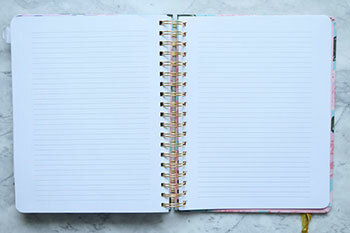 I finally decided to go old-school and bought myself a small pen/paper agenda. It was pretty nice to write everything down and have a good bird’s eye view of everything. But after a month, I realized that it was still too small so I took the plunge and just got a huge planner from BANDO. It’s 3X thicker than my laptop. Talk about going back to the stone age LOL. However, it has changed everything about the way I organize my time. 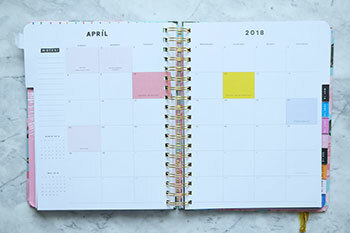 Small planner VS. bigger much more efficient BANDO planner. I put all my appointments on the bottom half of each block for each day. The upper half is reserved for social media posts/newsletters that are to go out that day. 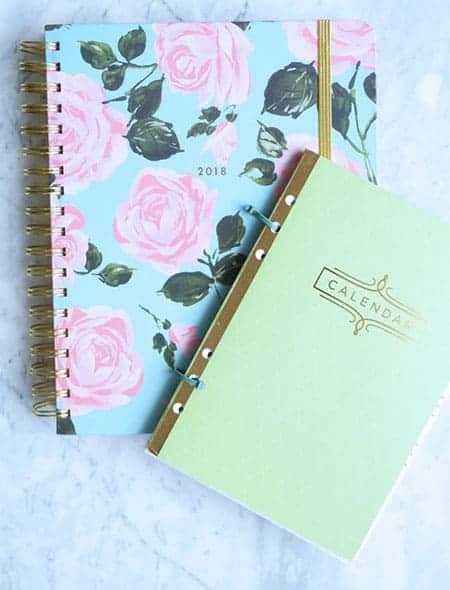 There is a NOTES section in the beginning of each month, here, I keep a running tally of all the items that need to be done during the month. I look over them each day and transfer those items onto the Daily To Do section. See next photo. 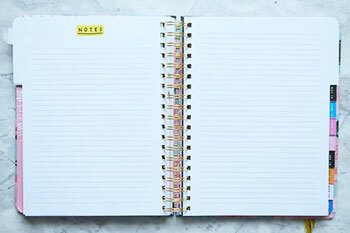 Daily TO DO section has ample room for writing down all the items that need to be done each day. I get these tasks by looking at my Monthly Calender View & Monthly Goals list. I also write down things that happened on that day which may be useful to look back on in the future. Long Term Projects are listed here. There is no time frame for when these are to be done. It’s simply a list of creative projects that can be considered for the future. 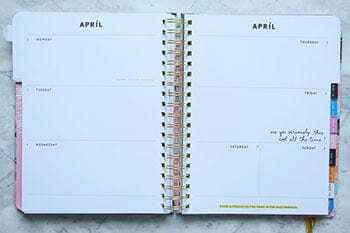 This list should be checked a few times a month and items should be taken out of the list and added to the monthly To-Do’s periodically. I keep receipts that need to be filed here. Every week, I take these, input them into an excel file to keep track of expenses and file them into another permanent folder. I continue to use 3 mobile apps for organization since I can’t always carry out such a big planner. I keep track of my appointments on GOOGLE CALENDAR so when I need to make an appointment, I can quickly refer to my phone to see if I’m available. This can be accessed on desktop as well which is so useful. 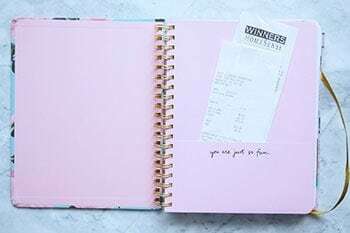 I use TO DO-IST to keep a simple clean shopping list. I keep this as a widget on my home screen so it’s easily accessible, especially handy when you’re in a rush at the grocery store or mall. A: You can use a combination of Black gel color from Americolor and black powder color together. A: Hi, I’m glad you found my tutorials useful. 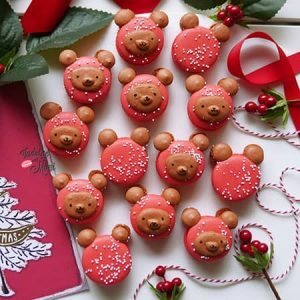 For this bear, I would wait until a thin skin develops before piping the next part and then wait until it dries completely. Like very dry! before placing in the oven. 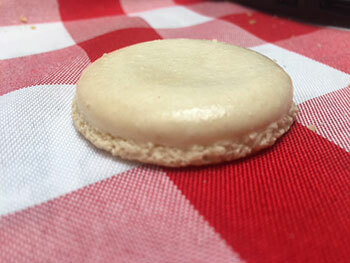 The full tutorial for batter on batter macarons here. 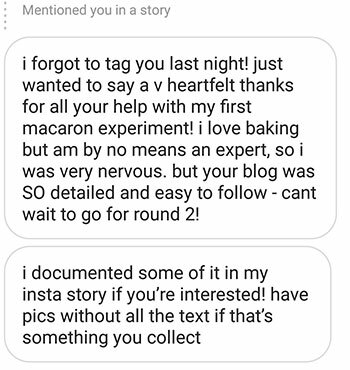 From the photo you showed me of your macaron, I would watch out now to over-whip the meringue to avoid hollow macarons. Whip until its firm enough not to slip around when you turn the bowl over. A: Wow! these are soo nice! 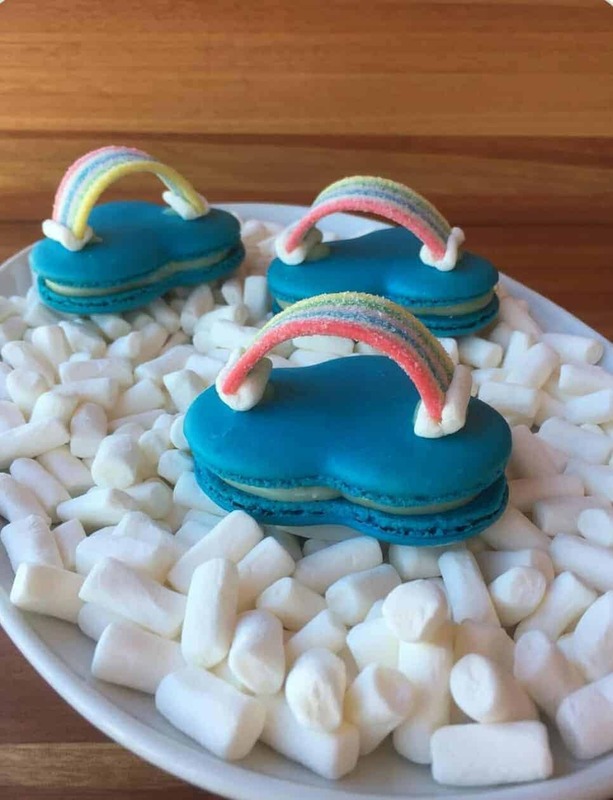 I’m glad you were able to use my Over the Rainbow Macaron tutorial to make this. It looks fabulous. 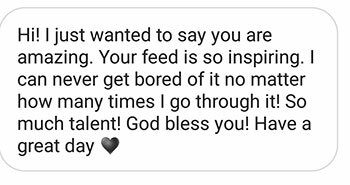 I hope you read this message 😳. A: You may not have whipped the meringue stiff enough. Also watch out for the colours you put in. Make sure you shake them well and is at the right consistency. Older gel colours can break your meringue. A: Thank you so much! I really appreciate the love! 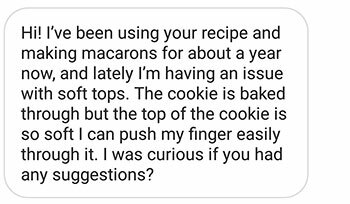 Hi I was wanting to see what brand of food processor you use to grind your almond flour? Thanks! 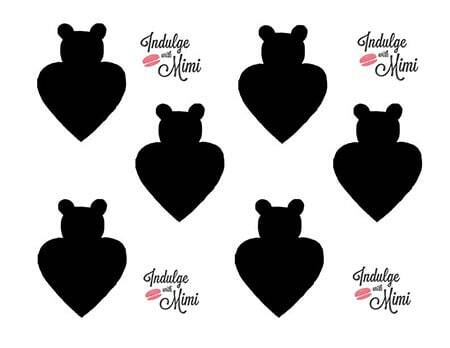 Hi Mimi! Quick questions: Have you ever used coconut flour instead of almond flour? Is that possible? 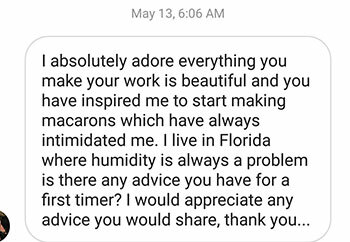 I like your macaroons. They are beautiful. I have a question. Can I use pure icing sugar instead of icing sugar with corn starch? Yes you can. However, I know some bakers like to add extra corn starch to make the batter more stable so you can always add some into your dry mix if you like. 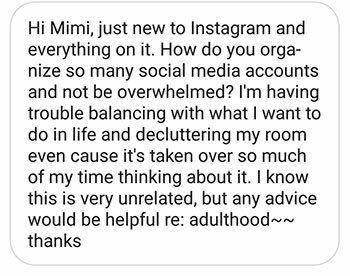 Hello Mimi, please help me. I´ve tried your recipe several times but I always end up with the same problem and I don´t know which step I am doing wrong. My macaron batter is way too thick, it doesn´t even fall from the spatula. I use aged egg whites, weighted all my ingredients with a scale and my meringue reaches stiff peaks. I just don´t know why it doesn´t mix well with the dry ingredients. I fold in the dry ingredients little by little, at the beginning it looks good but by the time I finish folding all the ingredients the mixture just gets thicker and thicker even when I keep folding for a while. 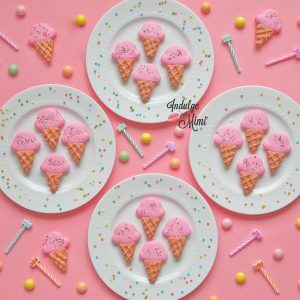 Usually, this problems is due to incorrect measurements of ingredients or incorrectly splitting up the batter into multiple batches. Some other issues to look for are overwhipped/dry meringue, egg freshness, almond freshness and gel colour freshness. Make sure to add the gel colour in the meringue stage and not during folding. 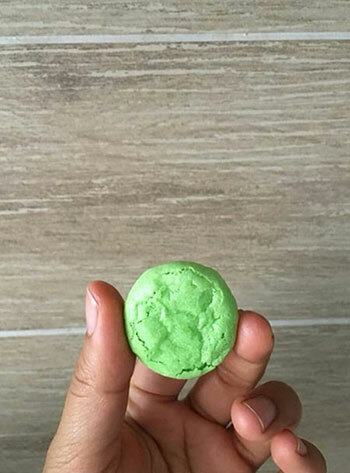 Some of your macarons are incredibly beautiful. 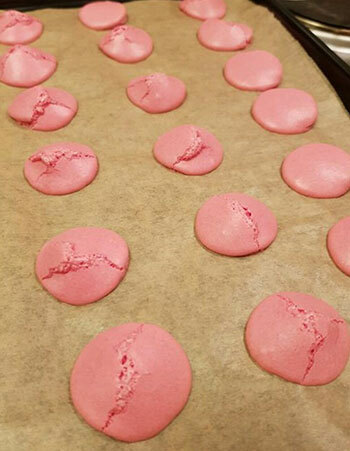 My macarons are lopsided, I tried different recipes, piping at 90degrees etc, I am baking at 110, Miele fan forced oven. Is my oven the culprit if it is what settings should I bake them at. Hi, it’s hard for me to know exactly which is the culprit without looking at your process. 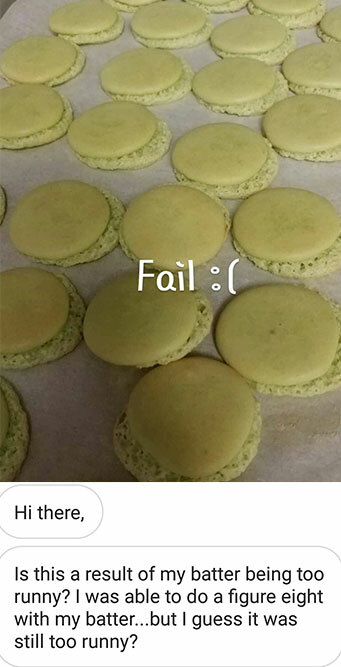 Here are some reasons why your macarons may be lopsided: Macaron Trouble Shooting Guide, look under lopsided macarons. I would recommend you adjust your techniques before attempting to change the oven settings. I seem to have better luck with the Italian method. Do you have a video of your recipe using the Italian method? 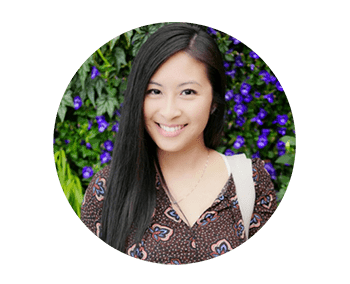 I love your site and have learned so much! This may seem like a silly question but with cakes and etc. the flour or powdered sugar is sometimes weighed before sifting and sometimes after sifting. So do you sift then measure almond flour and powdered sugar or measure then sift? No, that’s a totally valid question. The almond flour and sugar we need is after sifting. I usually measure it all out beforehand and if there are any almonds that can’t be sifted, I would compensate with more almonds that can be sifted. 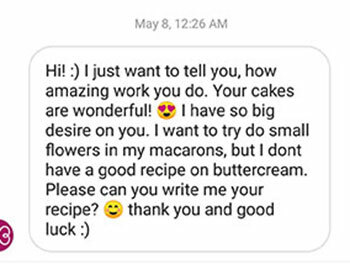 I have been having amazing luck with your recipe so I don’t want to start from it! What I want to do is use freeze dried fruit in my shell as a flavor. 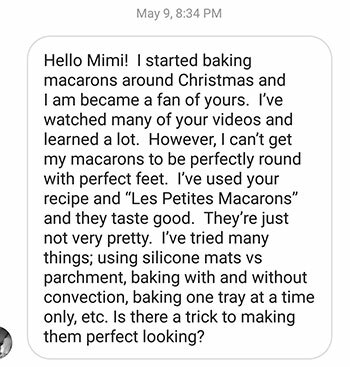 I have seen this on a couple of Macaron pages I follow. How would you go about using them? 5-10 grams per batch? Would you remove the 5-10 grams of almond flour or sugar or just add the freeze dried fruit? I would think they may have to be baked slightly longer as I have that with chocolate shells too. Would love your opinion on this! Should egg whites be weighed before or after aging? Egg whites should be weighed before as they sometimes lose some weight after aging. Have you read this post yet? How to age egg whites for baking macarons. 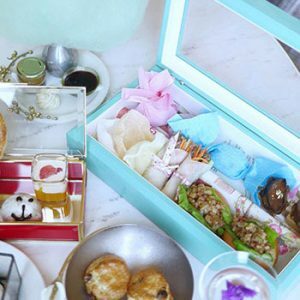 First, I love your page, it really is amazing! 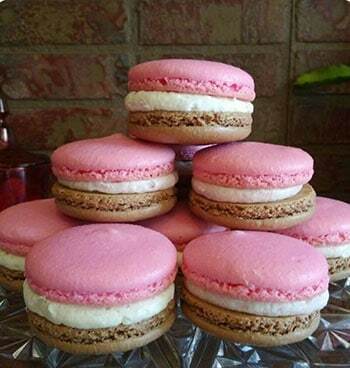 I have been making macrons for the past couple of months, experimenting and trying to find the perfect consistency. I tried your recipe and I love it as its a smaller batch. My problem is the shells are taking forever to dry and I mean forever….I had them sitting out last night for 3 hours and they were still tacky. I left them out over night and they finally dried….baked them in the morning and feet barely formed but that was most likely because of being left out all night. What could be causing them to not dry? I live in Surrey, BC so the weather shouldn’t affect them, I have put the stove fan on, doesn’t help. I have followed your recipe and I weigh all my ingredients. Watched all the videos…. I live in Vancouver so I think there should be no problems with the shells drying. Even on a wet rainy day which we seem to get so much of here 🙂 I think there is something wrong with the batter, not the weather. You should watch out for beating the meringue stiffer and don’t overfold. 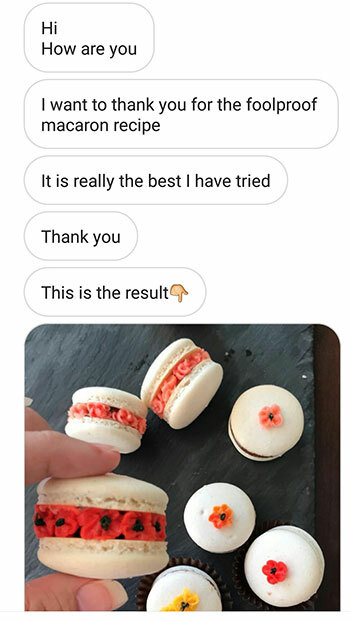 My macarons looks great on the outside but for some reason my macs are half hollow – the top of the shell inside is hollow and the bottom part of the inside of the shell has a sticky consistency. However, I’ve noticed when I make chocolate macarons with cocoa powder I have no hollows! Help! 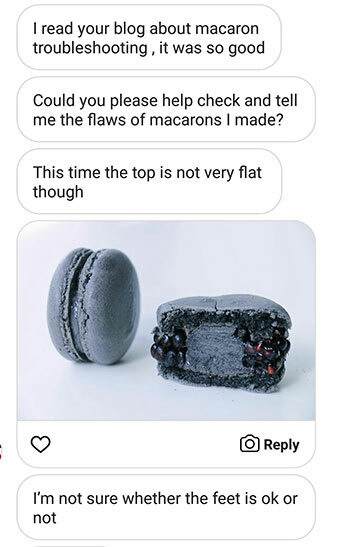 I wrote a new post on What Causes Hollow Macarons. The hole is more due to the meringue and the stickiness due to the heat. Take a look at the new post.